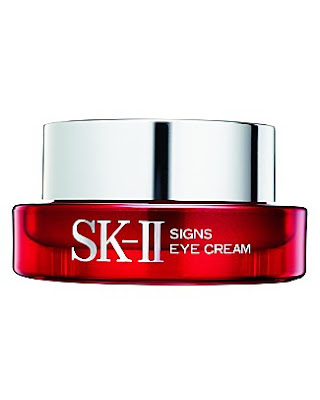 I think I've found the holy grail of skincare ... and its name is SK-II Signs Eye Cream. Ever since I started using this luxurious eye cream, I've noticed a significant difference in the wrinkles and dark circles around my eyes. I was starting to get -- gasp! -- crow's feet, and they have seemingly disappeared in the last four weeks. And the unsightly dark circles that never seem to disappear? They disappeared. This is thanks to SK-II's exclusive Pitera moisturizer complex, which drenches the skin with moisture and leaves it looking and feeling refreshed, bright and rejuvenated. I know this eye cream is an indulgence. But if you're looking for one that really and truly makes your eyes younger in an instant, this is the one for you. SK-II Signs Eye Cream retails for $105. I'm curious because I'm thinking of purchasing a new eye cream -- how do you know the results come from this cream, and not the shu uemura cream you reviewed a couple days ago that supposedly does the same thing? Thank you! I've been using them for different things, so it depends what you're looking to have the cream do. I use the SK-II at night and Shu Uemura in the morning. Shu is more of a gel, SK-II is a cream. I've definitely noticed plumper, firmer skin with less wrinkles from the SK-II -- Shu helps to add moisture and get rid of dark circles. Good luck with your decision!